Driving into Scotland after 2018. 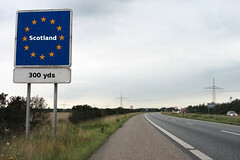 One fact that seems to be overlooked by many commentators is that when the UK leaves the EU, all EU citizens living in Scotland will get disenfranchised overnight because it’s an EU rule that gives us the right to vote in local elections, and independence referendums use the same franchise. So when Brexit happens, we’ll suddenly have no special status and will be treated the same as Americans or Argentinians, which means we won’t be able to vote. Because voting Yes to Scottish independence this time is a complete no-brainer to any EU citizen living in Scotland (differently from last time, when many thought continued EU membership was secured better by voting No), it means we will lose up to 173,000 safe Yes votes by holding the referendum after the UK has left. You’d need to feel extremely confident about the result of Indyref2 to discard these safe Yes votes just because you don’t really like the timeframe it imposes on you. However, there are many other good reasons to hold the referendum before Brexit happens, as explored well by Wings over Scotland today. So if we assume it must happen by next May, that makes May 2019 the logical cut-off point for Brexit. It’s coincidentally also the date the next European election is due – an event which of course remains on the UK political calendar, precisely because we haven’t even begun the process of Brexit yet. It would be farcical for the UK to still be an EU member at that point – because we’d still have to hold those elections if there was no clear exit date in place – but in the current UK political climate, something being farcical is no barrier to it happening. Nevertheless, let’s take it as the closest thing that we’ve got to a rationally plausible outcome. It would make sense to hold a second indyref at the same time. It would massively reduce the costs and admin, and it’s infinitely preferable from everyone’s point of view – Scotland’s, the EU’s and the rUK’s – for Scotland to STAY in the EU rather than to be dragged out then try to JOIN at a later date. One last note: At the rally on Glasgow Green yesterday, Robin McAlpine seemed to argue that we had to wait till at least 2020 before holding Indyref2 because Westminster won’t let us hold a new referendum before 2019 because they’re too busy with Brexit to allow themselves to get distracted by other matters. Surely that’s an excellent reason to hold it sooner rather than later – it can only help us if Westminster are too busy to interfere, and as somebody who believes in the sovereignty of the people of Scotland I don’t think Westminster can morally or politically block it anyway. Not so sure that they were YES – many voted NO believing that an independent Scotland would be out of the EU and they would be expelled . That was part of Project Fear’s success. Very true. However, they will surely all vote Yes next time (if they’re allowed to vote). Not all of them. I will admit that very few of them are likely to vote no. But many may not turn out at all. Some just don’t vote; others may feel that Scotland’s independence is not theirs to decide. Finally, lots of EU nationals, including some that live in another EU country, feel that the EU as such is simply a bad idea, and so they won’t be motivated to support independence for Scotland in order to allow Scotland to remain in (or join) the EU. You never know – some EU citizens might vote No, in order to remain within the UK where they will have special status* – if they vote Yes, then perhaps they will then be less able to move south in future, for job opportunities. *assuming that existing residents from the EU are accorded residency rights of some kind in any brexit deal. And possibly they will look at other factors such as public spending on services here, and how it might be impacted by independence. True, there will be a few. However, even if we EU citizens are allowed to stay, many of us are worried about getting discriminated against in various ways in the future when the EU’s rules (that say that EU citizens have to be treated the same as natives) cease to apply, so I’d be very surprised if the vast majority don’t vote Yes.